A number of years ago I was painting large-scale portraits of the musicians in a night club in Santa Monica, Ca. named The Temple Bar. The completed portrait paintings hung in the windows that faced Wilshire Blvd, a well traveled street. I frequented the club, one or two nights a week for about five years. As you can see by the photograph the paintings were put in a circle and the camera spun around to animate the look of the basketball layup being made. 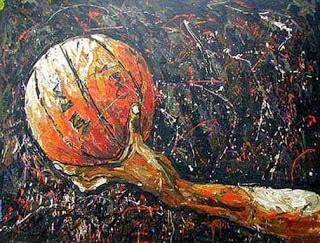 They also showed an artist painting the basketball paintings in a very expressive, impressionistic way. I was not in the commercial as they hired a young kid to play my roll as the artist. The director said, as an older person, I was not the demographic they wanted as the artist. Griffey Jr. and Derek Jeter interviewed Willie for 4 1/2 minutes. Again, my sports paintings were featured in the interview. I was now identified as a sports artist. An artist sports agent contacted me and started representing me for big commercial jobs - stadiums and arenas, restaurants, corporate offices, etc. And I have been doing that ever since. The bottom line of it all is that I was very lucky to have been "discovered" by someone at Fox Sports and then by the agent who promoted me.